Our organisation is one of the renowned names of the market engaged in offering a genuine quality range of Mobile Pumping Accessories to the valued clients. These mobile pumping accessories are exclusively designed by our team of experts, considering the industrial requirements. In addition to this, we acknowledge these accessories for their durability and dimensional accuracy. We offer these accessories to the clients at industry leading prices. 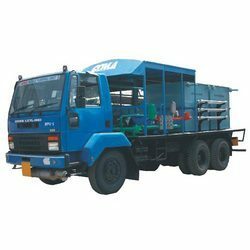 Goma Offers Mobile pumping unit (MPU), suitable for oil field fluids (such as brine, water, oil, effluent etc.) MPU comprising a high-pressure Horizontal, Triplex, Single Acting Reciprocating Plunger Pump driven through Transfer Case from truck engine, gear pump for oil suction, storage tanks, flexible joints and oil field skid platform with truck chassis as per our design to meet following flow rate and discharge pressure. Looking for Mobile Pumping Accessories ?